I read this article and found it very interesting, thought it might be something for you. The article is called What I Teach My Son When I Say I Am Fat: Practicing Self Love for Our Children’s Sake and is located at https://thebodyisnotanapology.com/magazine/what-i-teach-my-son-when-i-say-i-am-fat/. This piece first appeared on the author’s blog, Bipolar Spirit, and is reprinted here by permission. You can read more of Katie’s work on her site RevKatieNorris.com. “Fat” is not in itself a bad word. When we add qualifiers to it like “disgusting,“ or when we use it in a negative way, then it becomes a problem. As the mother of a boy, I thought about what mothers teach their sons when we speak badly about our own weight and appearance. In that article, I heard two voices from my own life. I heard my son’s voice, who so often has said, “No, Mommy, you are pretty,” after the many times I have made comments about my body like that. I bet that, almost daily, I say something negative about the way I look, and I know my son hears it. It has become a daily part of my life. It’s as natural for me as it was for the girls in grade school who told me I had to be at the bottom of the pyramid because I was so fat the rest of them could not hold me up. As natural as the people who made fun of me for having fat legs. As natural as the people who told my husband when we were dating that I was not pretty enough for him. It seems totally normal to me to feel required to never let myself forget that I am fat and ugly. Body weight is a sign of beauty. There is one universal standard of beauty that we all must conform to. His idea of beauty is wrong (because he thinks I am pretty and I am telling him I am not). A wife must look a certain way to be good enough to be seen with her husband. I am worth less than my husband. I am not someone anyone would want to be seen with in public, and thus maybe even my son should not be seen in public with me. Men should not love women who do not fit the cultural ideas of beauty. A person’s self-worth is based on their weight. I do not practice what I preach. I preach body acceptance and self-love, but I do not practice it. Self-loathing is better than self-compassion and love. It is okay to judge others’ worth by their weight. It is okay to judge himself by his weight. 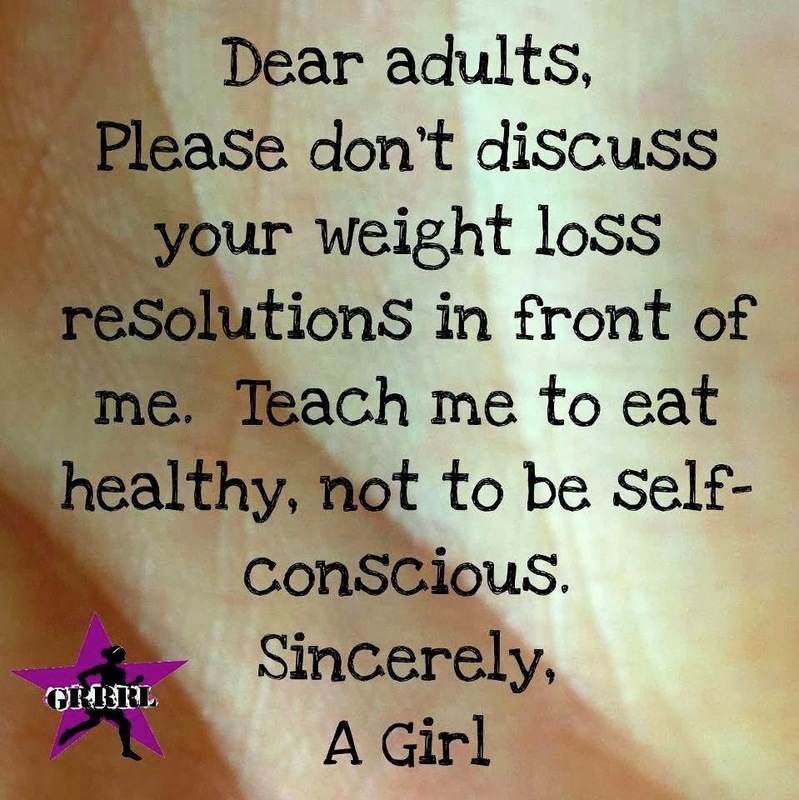 Against a light-brown layered background, the graphic reads, “Dear adults, Please don’t discuss your weight loss resolutions in front of me. 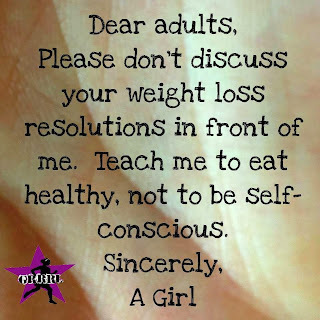 Teach me to eat healthy, not to be self-conscious. Sincerely, A Girl.” In the lower left corner is a black figure running inside a purple star with the word GRRRL across the front. So, rather than resolving to lose weight again this year, I resolve to not talk about weight loss or worth being attached to weight in front of my son. Eventually, I want to never talk about it to anyone again, but I know I am not able to do that yet. However, I can take the step now to not expose my son to seeing his own mother hate herself because of her weight. I think there’s another lesson that got taught here (and missed by the author): That “fat” and “beautiful” are mutually exclusive. They certainly are not, but we hear this same conversation so often. Someone says they are fat – whether they mean it in a negative way, or a neutral way – and someone else responds, “No you’re not, you’re beautiful!” People are not just one thing or another, and being fat does not mean someone is not beautiful. Being aware of the messages we are teaching others is a huge step in changing those messages for little ears – and for our hearts and minds! Awesome! I never know how people find what I write half the time. It’s good to see that the body positivity message is getting out there in lots of ways. Good point Bethany! I should have clarified that the problem is when I tell my son I am fat and I buy into the cultural stigma that fat means not beautiful. Which is totally wrong, as you point out. We could reclaim the word “fat,” which many people are doing. Making it just another descriptor and a fact rather than placing value on the word fat.